Whilst in Kuala Lumpur, we visited some interesting place called PutraJaya. Malaysia bosts about its beautiful and spectactular landscaping and architecture and design, some of the design borrowed from other booming cities across the world. Heres some info and pics I have found to better describe this place. pics are from www.pbase.com/zainudin. 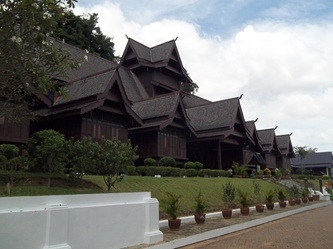 Info PutrajayaMalaysia began its search for a new Government administrative centre in the 1980s to disperse some development away from Kuala Lumpur. A site at Prang Besar in the district Sepang was chosen, in view of its strategic location between Kuala Lumpur and Kuala Lumpur International Airport (KLIA). The New Federal Government Administrative Centre is named as “Putrajaya” in honour of Malaysia first Prime Minister, YTM Tunku Abdul Rahman Putra al-Haj, for his invaluable contributions to the nation. While Kuala Lumpur will remain as the country’s capital city as well as premiere financial and commercial centre, Putrajaya will play the role of the new Federal Government Administrative Center. Construction of the new city began in August 1995. When the city is fully developed, it will have a total of 64,000 housing units which will cater a population of around 320,000 people. Putrajaya sits on a magnificent 4,931 hectares of land is strategically located within the Multimedia Super Corridor (MSC), approximately 25km south of Kuala Lumpur and 20km north of the Kuala Lumpur International Airport (KLIA). Being served by a network of highways and Express Rail Link (ERL) from KL Sentral Station to KLIA via the Putrajaya Central located in Precint 7. Putrajaya is being developed based on the theme of City in A Garden. Of the city’s total land area, about 38% is being developed into parks, lakes and wetlands while remaining is reserved for government offices, commercial and residential areas, as well as public utilities and amenities. The centrepiece of the city is the 600 hectare man-made Putrajaya Lake as its principal landscape feature and serves as a climate moderator. Currently, the lake offers activities such as boating, canoing, kayaking and fishing. Being located within the Multimedia Super Corridor, and in line with the Government’s e-Government initiative, Putrajaya is also developed as an intelligent city. Multimedia technologies will be in place to facilitate communication and interaction between Government offices, between the Government and the business community, as well as between the Government and local population and general public. Salam Alaykum All.. Selamat Pagi dari Ayer Molek... We have a few pictures to show, first is the Muzium istana, the palace museum (from left), which we visited. 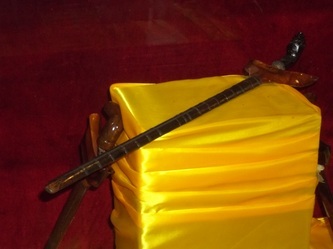 A long Keris which was used in the time of Hang Tuah. 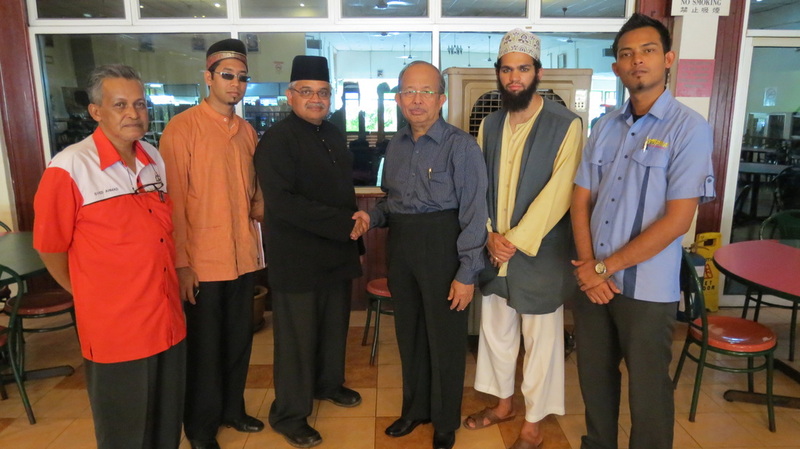 The final picture is when we met DMDI (Dunia Melayu Dunia Islam) members for a meeting for closer collaboration between Pukulan melaka South Africa and Malaysia. The person shaking Tuan Hj Hilmy's hand is the vice chairperson of DMDI Datuk Dr Hj Mohd Jamil bin Mukmin. We will update some more pics soon again Insha Allah. Alhamdulillah, since our last report, we have been drinking from the fountain of silat. Indeed, the thirst returns soon after its quenched. Firstly, as silat students, Haji Mokhtar encourages all students to recite the holy Quran. On Friday night we completed the Khatam of the Quran, and I (faheem) was honoured to do the Doa of khatam. Spirituality is inseparable from the true art of silat, and we are continuously guided through the teachings of the old masters and the works of Sufis. "whoseover doesnt have a wirid (daily dhikr), he is a Qird (monkey)".. this is how Haji jokes with us. So far, the spirit of Pukulan Melaka is being slowly revived as old loyal students visits the gelanggang one by one. Some of the students who live in Melaka hasnt visited Haji Mokhtar for 10 years, but because they heard of South africans staying at the gelanggang, they now return. Shaarani, one old student who always kept contact with me via facebook, taught me a beautiful malay saying, "Sirih pulang ke gagang" meaning that people will always return to their source. More and more of the old Pukulan Melaka clan comes to visit us daily. Training takes place anytime during the day, whether in morning, afternoon, or at night. Sometimes we train after Esha solah until 2-3 o clock in the morning. Sleep less, train more. We were also honoured to be invited to the wedding of Jai, one of Haji Mokhtars old students from Kampung Durian Daun. The food was so deliscious, just like all the other foods around here. The beautiful Kampung (village) scenery) was spectacular, according to Haji, this was one of the last remaining original kampungs in Melaka. One thing we have noticed is the utmost respect between student and Guru, as we alll adopt the practice of kissing the hand of the Guru upon giving Salam. Students previously came to the gelanggang to study, sleep, practice, or just hang out. We are told that that Pukulan Melaka was one of the most popular silats in Melaka, and also had the Biggest gelanggang. Although we have had some glitches along the way, we stay focussed on our goals. So a sincere apology for not updating more regularly, but be certain that we are busy in training. Ma'assalaamah, from me and Pak Hilmy. please make doa for our continuous safety and success. Alhamdulillah, today is our third day staying at the training area called a Gelanggang, at our Silat Guru hj Mokhtars place. Its been a struggle getting online as we had a little glitch with PC and network but alls ok now. Our Journey started on monday evening from Cape Town airport, stopping over at Johannesburg and then to Doha. We arrived on schedule at Doha airport on Tuesday morning, but upon arrival we were told that our flight was full and we had to stay at the Doha Hotel until 6pm the same day. this provided us free opportunity to roam the streets of Doha, Qatar and also perform solah at the local mosque. We then flew over to Kuala Lumpur, Malaysia and arrived wednesday morning. The first thing I noticed when flying over Malaysia was the beautiful areal view of millions of palm trees, which is indeed a spectacular sight. Meeting Tuan guru Hj Mokhtar at the exit gate was such a relief but even a greater honour and brought back so many memories. Smiling all the way to the Kampung (village) in Ayer Molek, melaka, and chatting lightly about various topics made our 3 hour drive so short. We stopped along the road for a traditional malay breakfast of Nasi Lemak (coconut rice), fried egg, and sambal ikan bilis (spicy sauce with dried crispy anchovies) and salad. Training started immediately after arrival at the gelanggang. Silat, silat and more silat is what is expected of us here. All we can say is Alhamdulillah the knowledge being unfolded is truly awesome, and we recieve great hospitaliy from Our Guru and his Family. The weather is hot and rains daily... but the food is so tasty haha..